Part of Athena’s name comes from the city of Athens and in sankskrit is related to vadh (to strike) and adh ( hill) The name of the goddess may be understood as directly “one who comes”. This would be keeping in the sophic element of the Gnostics. There is even a story of how Teiresias who seen Athena naked went blind, but Athena gave him the gift of prophecy as a compensation, Athena was often accompanied by a serpent called Erichthonius, athena was represented as a warrior/goddess of wisdom. Athena was called the daughter of Zeus often resembling the Sophian emanation from the Godhead or Pleorma. Athena was also analogous to Sarasvati in Hindu myth as a personification of moisture / wather, but it has been hypothesized that the goddess might have also represented a stormy cloudy one and thus better suited to represent the Vedic Goddess Vach. The scarf around the woman could be a chiton, which was sometimes girdled with serpents, the classical art version of Athena was also accompanied by a serpent and her shield contained the head of a gorgon, which was what medusa in greek legend was. Athena had a “androgynous Compromise” that was a mixture of male and female elements. In depth psychology Freud believed she was a primordial goddess divested of power, Which as we said earlier the Archons of Gnostic Myth were reported to have tried to take the power from Sophia to keep her from waking up adam and showing the fallible nature of Yaldabaoths creation. 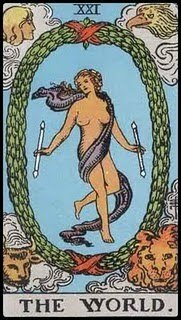 This is where we come to an end in the common attributions of the tarot card XXI, The card in each of the representations given has shown from a vast amount of culture and sources that this key is highly represented by gnostic myth and teachings. Particularly Sophia and the Myths of Female goddesses in particular share a deep identification with aspects of this wisdom , Therefore it will be shocking to see for some that are stuck in old paradigms that the Female was actually more “wise” than the male in lots of goddess centered thinking. The reasoning besides that of giving life was that she was more in tune with the cycles and harmonies/disharmonies within the archetypal consciousness of the cosmos. Mathematically the cycles of a woman’s menstruation have created not only our tracking of seasons but a correspondence with the agriculture of ancient civilization. This was perhaps the worst kill of culture and thinking that Yahwehism did to the ancient beliefs. Kill the mother is the sad and tragic motto of our false god Saclas, in stating ” I am a jealous god, thou shalt not worship any other god before me”. He actually destroyed his own nature and swallowed its tail by excluding the primordial mother from his thinking and attempts to do this in modern culture unfortunately haven’t been resolved as of yet. Hopefully when this study reaches our new generations of “macho men” boys that are pervading modern culture we will have found that the thinking so closely related to this Yahwehism has not only killed our ability to achieve gnosis , but has also destroyed our hope of any kind of balance. Therefore all the tarot keys have a spiritual and practical element to them. Let us never willfully forget or violate our women , sisters, wives or mothers and her archetypal source the divine Sophia.